When Walmart Stores (WMT) pledged last year to buy an extra $250 billion in U.S.-made goods over the next decade, it appeared to be just what was needed to help move America's putative manufacturing renaissance from rhetoric to reality. "A lot of the tribal knowledge and skill sets are gone because the humans who used to do that work have either retired or died," says H. Kim Kelley, the CEO of Hampton Products International, a privately held maker of locks, lighting and other household hardware. The Foothill Ranch, California-based company began selling products made in Asia to Walmart in the 1990s and is now supplying it with some U.S.-made products. Trying to rebuild that manufacturing capability, while making products that meet Walmart's standards, can require companies to "start from scratch," Kelley says. Cindi Marsiglio, the Walmart vice president overseeing the U.S. sourcing push, says the retailer and its existing suppliers have 150 active reshoring projects in various stages of development. For all too many, she says, finding U.S.-made component parts has emerged as a vexing problem. Hampton, which also makes tow straps, tie-downs and bungee cords for the automotive market, had a hard time locating a U.S. maker of lightweight but strong polyester yarn. Marsiglio says other suppliers complain of difficulty finding small motors, as well as plastic injection molding equipment and computerized cut-and-sew tools. The issue is so widespread that Walmart is making it the focus of a two-day summit it is hosting in August in Denver. At a similar summit held in Orlando last year, Walmart focused on connecting suppliers with economic development officers from states hoping to lure the new factories. The retailer says it is especially interested in having factory owners with excess capacity attend the August event -- even those that aren't interested in supplying Walmart directly. The hope is that they can become contract manufacturers to Walmart suppliers looking to produce in the United States. On July 8, it is also inviting hundreds of potential vendors to an "open call" to pitch U.S.-made products to the retailer in Bentonville, Arkansas, where it is based. Walmart's critics say the company bears some responsibility for the diminished capability of U.S. manufacturers. For years, its relentless insistence that suppliers cut costs prompted companies to shut domestic plants and shift production to low-wage countries. Now, the retailer is asking companies to come back home -- though they need little prompting. The forces pulling production back to the United States are powerful and real and include lower domestic energy prices, increasingly competitive wage rates, the benefits of greater automation, and a renewed appreciation for the value of being able to respond quickly to shifting U.S. customer demands. Still, starting up a manufacturing operation is a complex undertaking, especially for vendors like Hampton and Redman & Associates, an Arkansas-based toymaker. Last year, Redman sold 1.1 million battery-powered ride-on toys, such as large toy cars, in the United States -- every one of them made in Chinese contract plants. By 2016, the privately held company plans to be producing about 600,000 of those toys each year out of a brand-new company-owned and run plant in the U.S.
Mel Redman, the company's CEO and chairman, says the transition has required the company to reverse engineer everything its Chinese contractors were doing -- an exercise that wasn't easy given his executive team's background in retail. "We didn't know much about manufacturing -- we didn't know anything about it really," he says. Walmart declines to say how many products it has introduced as a result of the 18-month-old Made in USA initiative. But the company says consumers can now buy everything from U.S.-made flat-screen TVs, light bulbs and towels and curtains in its stores and on its website. The flat-screen TVs, made in Winnsboro, South Carolina, by Element Electronics, may be the campaign's biggest surprise to date. Founded in 2007, Element had until this year made all its TVs in Asia -- but it was unable to get them on Walmart's shelves because there was nothing that differentiated them from rivals' products, says CEO Mike O'Shaughnessy. "So we began to think about what we could do differently. Well, one of the things we could do differently is to make our TVs at home," he says. Element built a small test plant in Michigan that began producing flat-screen TVs shortly before Walmart announced the Made in USA push in January 2013. The announcement prompted the company to fast-track its expansion. Today, Element's 315,000-square-foot plant in South Carolina has six assembly lines making 32- and 40-inch TVs that are now available in all of Walmart's more than 4,000 U.S. stores. %VIRTUAL-article-sponsoredlinks%The switch has led to significant savings in ocean freight charges and customs duties on finished goods -- though like so many companies involved in the initiative Element has had difficulty finding domestic suppliers. "We import the vast majority of our parts," says O'Shaughnessy. "Longer term, the more success we have procuring our parts domestically, the better off we expect to be." Although Walmart has given itself 10 years to meet its $250 billion goal, Marsiglio says the retailer hopes to meet the target ahead of schedule. She says the point of the "open call" next month is to simplify a product pitching process that can challenge even long-time suppliers. 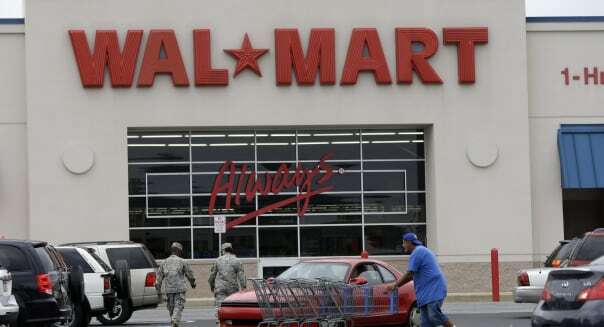 But while the door is open, the bar is high and Walmart will require any applicants to open their financial books as part of the screening process. Given Walmart's reputation as a tough negotiator with suppliers, the disclosure of sensitive financial information to the retailer requires a leap of faith. But Element's O'Shaughnessy said his company had no misgivings about opening its books. Walmart needs to know it can rely on its vendors, he said. "What does it cost to produce product? What does it cost to move product? Every one of the variables that make up the cost of the product we [shared] with Walmart," he says. For stories of companies still making great products here in the USA, check out the This Built America series. Father's Day is June 15, and retailers are discounting prices on tools and other home improvement equipment. Even if you're not buying tools for Dad, you may want to assess your own supply, since tools rarely go on sale. Check out coupons and newspaper ads for home improvement stores -- such as Sears (SHLD), Home Depot (HD), Lowe's (LOW), Menards and Ace Hardware -- to compare prices. If you're in the market for some hip summer clothes, June is an excellent month to hit the sales racks. "All the big fashion houses are making way for their fall collection, so now is a great time to scoop up those latest trends you've been eyeing," says Mara Heffernan, a shopping expert at Savings.com. That includes tank tops, shorts, skirts, maxi dresses, sandals, crop tops and more. Anyone working on their beach body, or those simply trying to maintain a healthy one, will benefit from slashed prices on gym memberships, fitness apparel and workout equipment in June. "With new year's resolutions forgotten and more people getting outdoors to take advantage of the nice weather, there's less of a demand for indoor gym equipment and gym memberships," explains Leah from CreditDonkey.com. Lack of demand equals decrease in prices. If you delayed buying a new grill for the summer, June and July are the best months for deals on grills. Also shop for grilling supplies, including utensils and grill baskets. "Due in large part to June being such a popular month for weddings, dishware companies offer discounts on their products to try to win spots on registries," notes CreditDonkey's Leah. "That's good news for everyone in need of new place settings, soon-to-be-married or not." Expect discounts to start around 25 percent off and to go as high as half off.